Home › All Publications › Family Well-Being – What makes a Difference? Family Well-Being – What makes a Difference? Why are some families happier than others? Why do some parents and children have higher levels of well-being than others? These questions are of interest to everyone but are of particular interest to family researchers and to those concerned with family policy and services. Everyone knows that families are important but how exactly do they influence our well-being? That is the key question at the heart of this study. 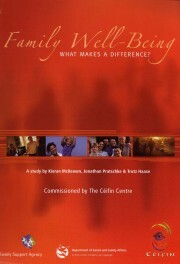 Study commissioned by the Ceifin Centre and Department of Social and Family Affairs, 100 pages.